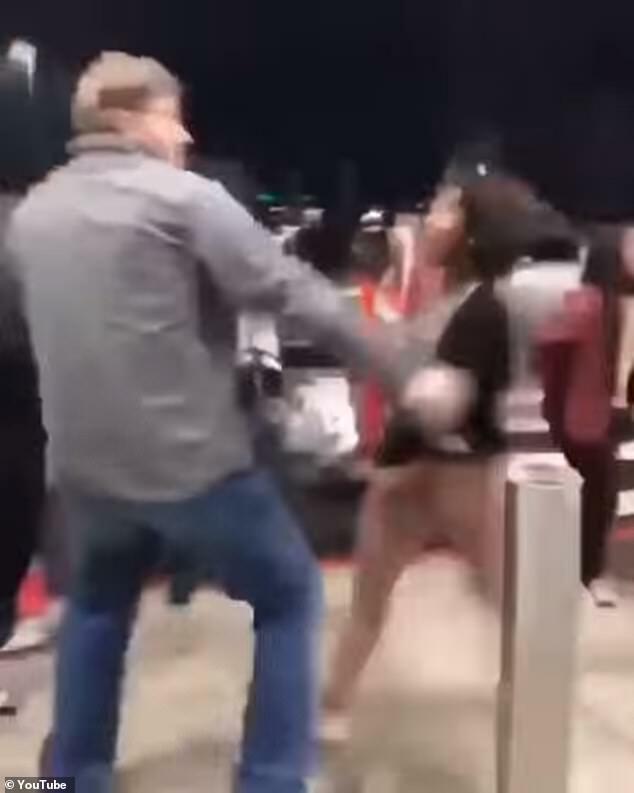 This is the shocking moment a middle-aged white man punches a young black girl in the face in front of a horrified crowd of kids standing outside a shopping mall. The altercation involving 51-year-old David Steven Bell and the 11-year-old victim was captured on cellphone video around 7pm Saturday outside the Asheville Mall in North Carolina. Bell is seen in the footage bickering back and forth with the group of young girls, before one of them harmlessly shoves him from behind. It's unclear what transpired between Bell and the children before the video was filmed. Seconds later, Bell is seen forcefully pushing the female victim in the chest before she storms toward him again. 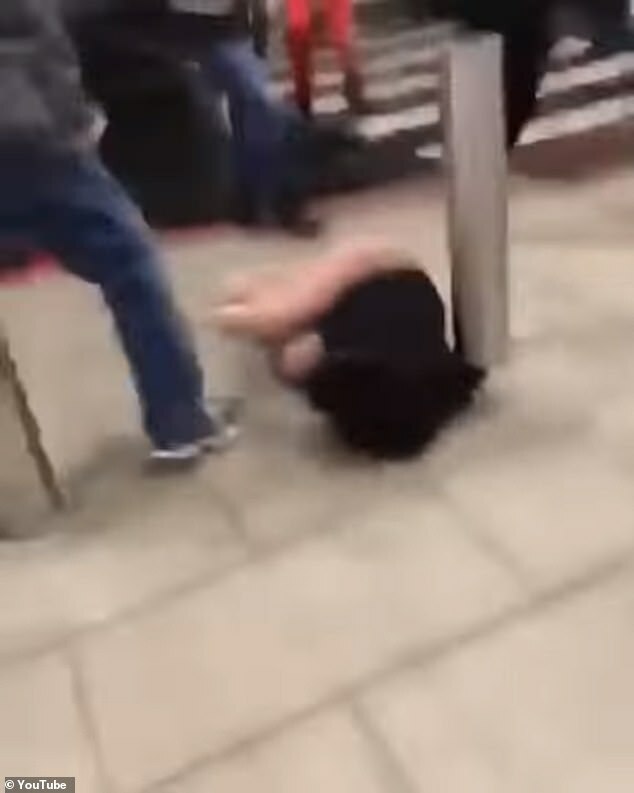 The man in the video violently punches her in the face and she falls to the ground, appearing to hit her head on the pavement. The girl filming then screams out: 'Oh my god! Oh my god,' before the video concludes. Bell is 6ft 5in and 250lbs, according to online jail records. Bell was arrested after the incident and charged with assault on a female under the age of 12 and two counts of assault. He was booked to Buncombe County jail but released around 1am Sunday. The victim declined medical treatment, according to police, who have not revealed the nature of her injuries. Bell's Facebook page, which has since been deleted, said he resides in Black Mountain and is married with two children. He is employed as an at-home piano teacher. 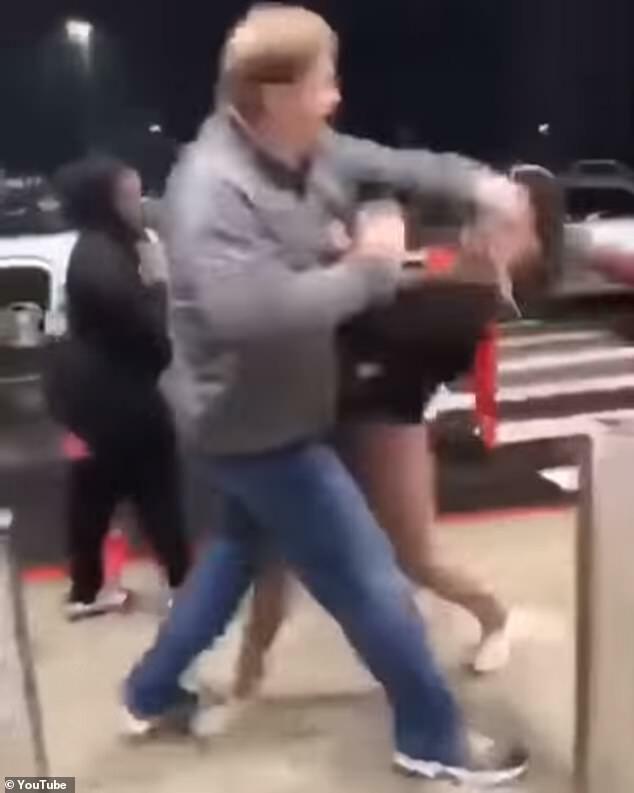 A woman who appears to be his wife is seen in the left-hand corner of the video watching the violent brawl in silence. Police are currently investigating the Saturday incident. The Asheville Mall also said in a statement: 'We are aware of the videos circulating on social media. 'The @AshevillePolice responded immediately and the situation was diffused. An arrest has been made. Play adult games, win adult prizes. It was overkill, but the kid was pretty stupid. Don't think she's gonna live to see 25 if she keeps that up.